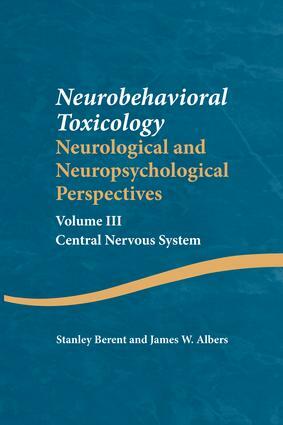 This is the final volume in a three-volume work that has addressed the scientific methodologies relevant to clinical neurobehavioral toxicology. Volume I focused on basic concepts and methodologies in Neurobehavioral Toxicology, with Volume II focusing on the peripheral nervous system. Volume III attends to what is known about industrial and environmental chemicals, medicines, and substances of abuse and how these agents affect the central nervous system. All substances have the capacity to be toxic, depending on factors that include the physical properties of the chemical or compound, organism related variables, or interaction between the two. These substances on the other hand and as a result of these same factors might be used therapeutically or even recreationally. The difference between medicine, recreational drug, or poison depends often on a careful balance between adverse and intended effects. How to determine that a specified substance has caused harm is emphasized in the present volume by way of case examples and discussion. Illnesses and behavioral variations that compete with toxicant-induced explanations for findings in a given case, as well as the various controversies that can arise around issues of diagnosis and causal determination, are treated comprehensively in this volume. Contents of Volumes I and II. Preface. Chapter 15. Industrial and Environmental Agents. Chapter 16. Medications and Substances of Abuse. Chapter 17. Conditions Associated With or Which Sometimes Mimic Toxic-Induced Central Nervous System Disease. Chapter 18. Consequences of an Incomplete Differential Diagnosis. Chapter 19. Issues and Controversies Involving the Central Nervous System Evaluation.